Cora Week was an artist from New York City. 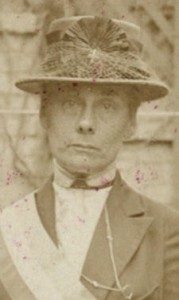 She was engaged with the National Woman’s Party (NWP) at several key events. She was among those who came to Alice Paul’s window at the DC Jail on November 9, 1917, to communicate with their leader who had been in jail for some time. They promised her they would picket at the White House the next day to protest her treatment. The police charged them with “obstructing traffic” and they were tried on November 12. The police testimony was refuted by defense witnesses. After eloquent testimony by the suffragists, Judge Mullowney admitted he was embarrassed by the Administration and dismissed the pickets without sentence saying he would take the matter under advisement. An hour later, 27 of the 41 women, plus a few additional women were out picketing again. Despite their surprise at such determination, police managed to arrest all of the pickets, 31 in all. They were ordered to appear in court on November 14. These pickets endured the “Night of Terror” at the Occoquan Workhouse which included beatings and verbal abuse. Cora Week was among them. Cora Week was again on the scene when the National Woman’s Party organized watch fires on the sidewalk in front of the White House to burn the president’s speeches on democracy in Europe. She was again arrested on February 9, 1919, and served time in the DC Jail in an area that was re-opened to house the suffragists. The environment was cold and rat infested.